Welcome to the IoW Clan Homepage! Welcome to the official website of the Instruments of War Enemy Territory clan! 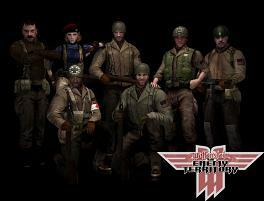 The <IoW> clan is a gaming community that primarily plays Wolfenstein: Enemy Territory. The <IoW> clan is an organized group of long time ET players who share a love and similar philosophy for the game. We host our own dedicated server, located in Dallas Texas and invite players of all skill levels to join us for games. Our community of players includes several current and past clan members, long time regulars, and former competition players. Learn more about what the <IoW> clan offers through the various links below. We hope to see you on our forums or on our server soon. Learn about Enemy Territory and download it for Free! Features of the <IoW> ET Server. Connect now! 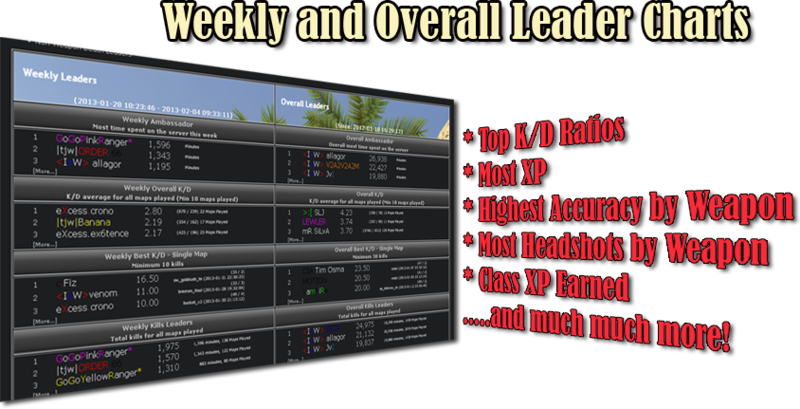 View weekly and overall leaderboards. Ways to interact with and join the <IoW> community. Enemy Territory is a first person shooter game for PC, Mac and Linux. The game is set during World War II. Don’t be fooled by the age of this game, the modest requirements or even its dated graphics: this game is second to none when it comes to action, team play and hundreds of quality maps and game modes. 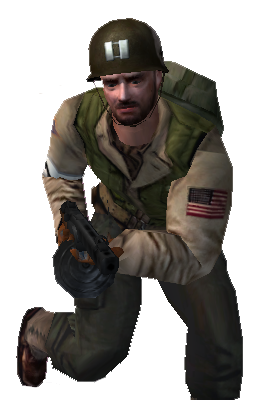 Players can play one of the primary classes: soldier, medic, engineer, field ops, or covert ops. Each class brings with it unique abilities and weapons that when used in combination with your team, can mean the difference between victory or defeat. Enemy territory not only features a class system, but also allows players to gain experience in various categories which help them perform their job better. Experienced players will gain additional ammo on spawn, gain a slight increase in weapon handling, be able to provide more ammo or health packs, or be able to build constructions faster. In addition, an intuitive voice chat system allows players to communicate with their team or the enemy through simple keyboard commands. Using these commands, a player can easily communicate to their team their position, and do things like ask for ammunition or health. The best part of Enemy Territory. It’s absolutely FREE to download, and FREE to play. And it has been this way since 2003! Despite the age of this game, it is still very popular and rivals many of the newer, flashier FPS franchises that people pay money to play. Why not give it a chance? Download and install the game, then connect to the <IoW> server. We’d be more than happy to help new players get their feet wet and learn the basics of the game. 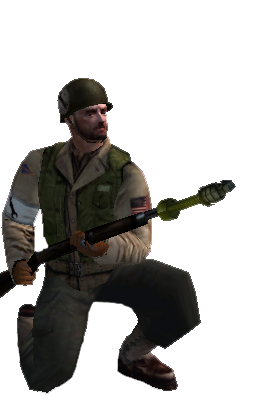 Learn more about Enemy Territory by reading about the five basic classes below. 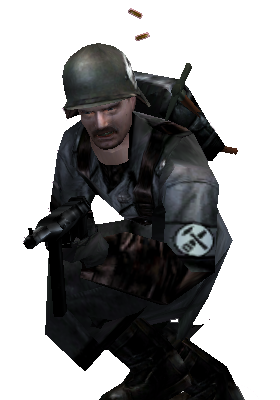 The soldier class can field the heaviest weapons on the battlefield. 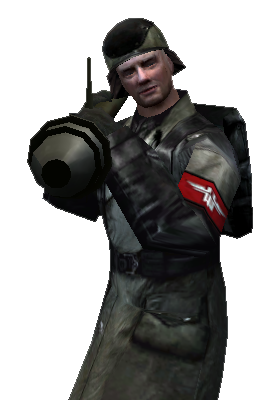 Blast the enemy with the anti-tank Panzerfaust! Drop shells deep behind enemy lines with the Mortar. 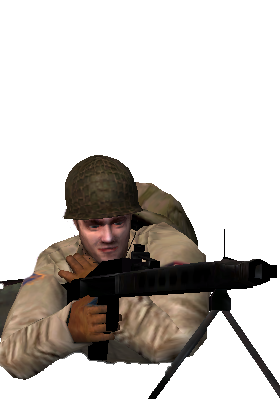 Lay in wait and prepare to ambush advancing enemy with the mobile MG-42. 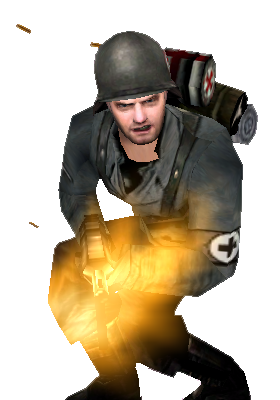 Clear a room of camping enemy soldiers with the devastating Flame Thrower. Watch a video of a Soldier in action. War is hell. Bullets and explosions everywhere lead to your brothers-in-arms wounded on the battlefield. 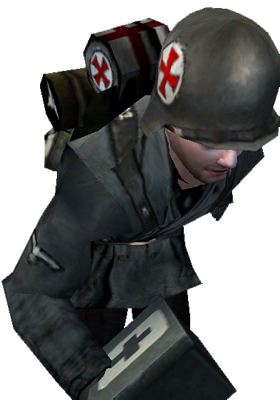 A few bumps and bruises and maybe some shrapnel can be patched right up in a few seconds thanks to the med-packs distributed by the Medic class. But even more critical wounds can be mended through the skills of a medics revive needle, capable of bringing critically injured soldiers back to fighting shape in no time, ready to complete their mission! 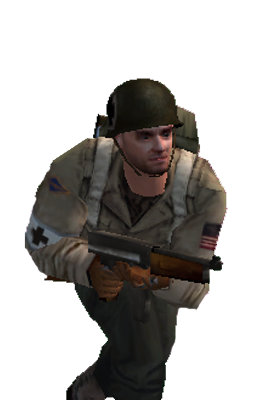 The Medic Class is key to a successfully coordinated attack or stubborn defense! 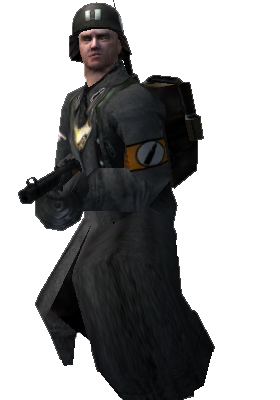 A medic is no master of weapons, they can only utilize a basic submachine gun, in addition to their pistol and a small allotment of hand-grenades. Watch a video of a Medic in action. War is more than just killing more of the other guys. Missions are defined by objectives. Many objectives rely on the skill and bravery of the battlefield Engineer. 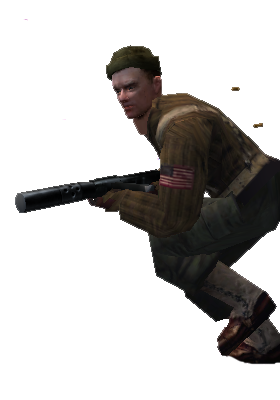 Under a hail of gunfire, an Engineer can use his tools to construct barriers to slow an enemy advance. An engineer can inflict a devastating tactical loss for the enemy by utilizing dynamite to destroy assets. Keep your team on the move by repairing damaged vehicles vital to securing victory! 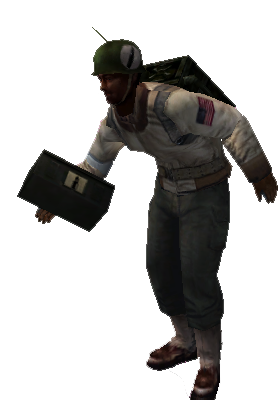 An engineer can slow the enemy advance by placing landmines at choke points or in heavily traveled areas. 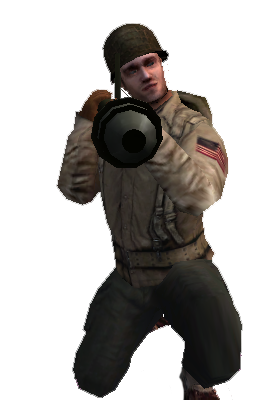 Engineers have their choice of primary weapon - from the standard sub-machine gun to the devastating riflegrenade! Engineers are also armed with dynamite, trip-mines, landmines and a generous supply of hand-grenades. Watch a video of an Engineer in action. Small battles, like those waged in Enemy Territory are only part of a greater military campaign. Heavy artillery and air-support are a few miles away, ready to aid the greater campaign with devastating death from above! The Field Ops has two primary jobs. First, to provide valuable ammunition to his fellow soldiers, and secondly to take advantage of the heavy hardware a few miles away. Using their binoculars, a Field Ops can pin-point areas on the map where off-site heavy artillery guns will send a barrage of shells, instantly killing any enemy that are near and damaging enemy vehicles, slowing their advance. For an even bigger punch, call up on the dive-bombers circling above by marking an area with colored smoke. Field Ops choice of primary weapon is relatively limited, although the ability to call on heavy support is a major advantage. Watch a video of an Field Ops in action. War is not always won by one side having overwhelming strength in numbers or sheer fire-power. Many battles are won in the shadows through superior intelligence, propaganda and sabotage. The Covert Ops class serves this purpose in Enemy Territory. Masters of the shadows, hiding in the brush aiming at the enemy with scoped sniper rifles. Providing cover for their fellow soldiers by masking their actions in a thick smoke cover. But most importantly, the ability to infiltrate the enemies very own ranks, gaining access to enemy bases and using disguise to fool the enemy before stabbing a knife in his back. The Covert Ops class has an arsenal of unique weapons. 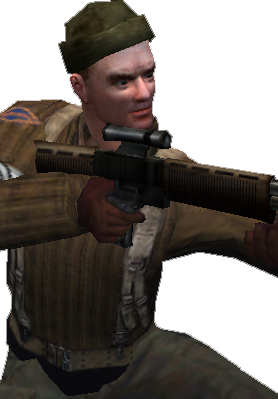 From scoped sniper rifles, to paratrooper assault rifles, to the devastating rapid-fire Sten. 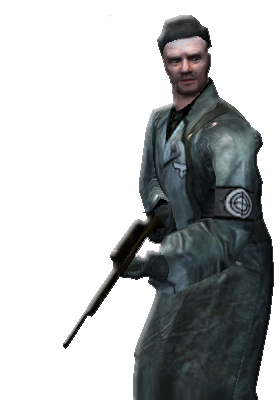 A Covert Ops also carries smoke canisters, explosive satchels and silenced pistols. Watch a video of an Covert Ops in action. The server is presently running the silEnT MOD for Enemy Territory. Only real players at IoW! This keeps games manageable. No massive 20v20 battles of chaos here. Up to 32 Maps to vote. Frequent map changes including a new map each week. Panzering, mining, arty, medding, whatever your style. Expect to play as a team and play for the objective. No waiting around twiddling your thumbs to respawn here. Upon first connection, a small custom download pack is required. No stuffy snobs here. Be prepared to laugh and have fun at IoW! No teams full of panzers. Help keep our server online. Donations are appreciated. Q: When Are There Games At IoW? A: Things look a bit slow now? Most games at IoW are in the North American evening hours, any night of the week but especially weekends. Q: What is silEnT MOD? A: silEnT MOD is the hottest new Enemy Territory MOD. It is based on ET-Pub so it has many similar features and a similar feel. 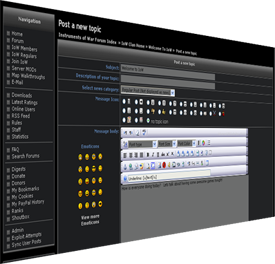 As of early 2013, an active team of developers continues to release new versions every few months. Q: What is different in silEnT MOD? A: silEnT MOD adds a few new weapons to the game. The Ppsh machine-gun , which is similar to the FG-42, but with more rounds and more power. Also added are trip-mines, a way for engineers to protect interior structures with wall-based mines and a trip-wire. In addition, silEnT has many new HUD improvements. Q: How do I Contact an IoW Administrator? A: Register at the IoW Forums and make a post. Or contact the clan-leader by e-mail: beck -at- iowclan -dot- com. Q: How do I Join IoW? A: Register at the IoW Forums and fill out a Join Application. Q: How do I connect to the IoW server from within the game? Be sure to enter the "slash" in "/connect"
Q: I'm having trouble downloading maps. What should I do? A: Be sure you are running the game as Administrator. This tends to solve many problems like this. By playing on this server, you agree to abide by these rules. Spawn killing/camping is allowed. /kill is also allowed anytime. Use of hacking programs (aimbots/wallhacks) are STRICTLY PROHIBITED by public members, as well as clan recruits and full clan members. We do NOT tolerate cheaters here! Majority rules. Use voting to settle disputes. Please be considerate of other players. We want everyone to have fun here! Team-killing and laming are not encouraged. Team play and objective-oriented cooperation is highly encouraged. Recruiting for other clans is prohibited on the <IoW> server, and is subject to removal of the offending player. Advertising is prohibited. Offenders may be removed. Respect all <IoW> members. Disrespect for rules and requests made by <IoW> members and admins will result in your prompt removal from our server, and possible banning. Treat all players with respect. Remember: its just a game. <IoW> Server welcomes players of ALL skill levels. Please help out new players and make the <IoW> server a welcome place for all. Only recruited <IoW> clan members may display tags on any of the <IoW> game servers. Displaying tags (or obviously similar tags) when you are not in the clan is grounds for removal. It is a privilege to play on an <IoW> Server. Senior <IoW> members may deny you that privilege for any reason we see fit, at anytime. 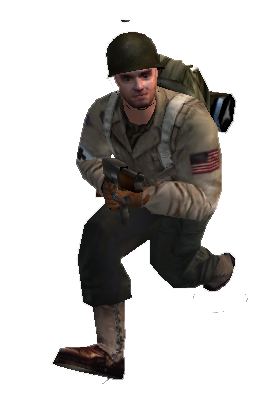 Repeated purposeful Teamkilling (TK) is not allowed, and is grounds for removal. These rules are subject to change at anytime without notice. Check back often. Failure to adhere to these rules will result in a warning from <IoW> administrators. Repeated violations of <IoW> server rules may resulting in your removal (temporary or permanently) from the <IoW> server. Find your friends, and chat outside the game with X-Fire. IoW hosts its own Teamspeak 3 Server. Many members and regulars can be found on there, and we love to get to know our community. The IoW Server has a customized stats tracking system that records data from all games played, aggregating values and displaying the data in an intuitive and easy to read format. Compare yourself to the other players at IoW on any number of statistical categories. All you have to do to get tracked is....play on the IoW Server! Registered IoW site users will gain access to the statistics module. If you are not signed up for iowclan.com, sign up now. It is IoW's philosophy that a great gaming experience on the server is further enhanced with participation in the wider community of players. Its much more fun to frag your friends than just some random white namer on some over-populated, bubblegum frag server. That is why we encourage participation on our message boards. This is especially important for those people who wish to join IoW. To participate in the forums, you can create an account by clicking here. Login to the forums here. IoW uses the forums to update our clan and community on the health and happenings of our gaming server. Registered members on the forums can help to determine the maps that are played on the forums, make suggestions for improvement, report problems with other players or ask technical questions about the game (e.g. configs) or other ET stuff. In addition, non-ET related threads are common to discuss the latest movies, music, and other games. Its a great way to get to know the people that you play with night after night. In addition to the forums, access to the Stats Module is only gained by becoming a registered forum user. So who is IoW? There is a long story of the history of this clan, but the highlights are that IoW was started in the summer of 2005 by Nort and Wolverine after their experiences with other clans failed, and the desire to find a server that fit their ideal for how the game should be played. Using their experience with failed clans, and the punitive rules and admin abuse they experienced at the hands of 14 year-old admins on some servers, Nort and Wolverine started IoW as place where "anything goes". The philosophy of "anything goes" means there aren't a bunch of silly rules about how far from a spawn you needed to be before you could dare fire a bullet - or whether or not it was okay to slash-kill in the middle of a battle - or whether or not it was okay to play panzer in a 2v2. It didn't matter; it was about fair games ("anything goes" did not mean HACKERS were welcome) and easy going admins who just let people have fun they way they wanted to. Of course objective and team-based play has always been encouraged from day one, IoW was started as a server that catered to the ETPro TWL player, just as it did to the fresh-out-the-box newbie. With a good server, several great people started joining IoW and helped to mold the clan into one of the most successful early ETPub clans in the game. IoW fielded a TWL Beta team that won some impressive matches, and the clan size grew to around fifty active members in the 2006-2007 timeframe. But age and priorities always rears its head, and although our beloved ET has seen declines in players over the last few years, the IoW clan still manages to recruit new members every month. To date, there have been well over 100 people who have been part of IoW since its inception. All of this is due to a great set of leaders, a dedicated and proud group of members, and loyal regulars who help to keep the IoW server busy, almost ten years after the game debuted. The IoW clan has seen many clans rise and fall, and many servers fizzle and fade away, but the same great IoW Server still adheres to its founding principles. It is a successful model of how to run a clan, and how to maintain a popular server. Think you have what it takes to be in IoW? We're always looking for active, easy-going, and outgoing new members. No hackers allowed, IoW is and always has been a HACKER FREE clan. Also, if you are just a rambo who thinks people are impressed with your k/d, probably not the clan for you. IoW periodically does scrimming, but IoW would be considered a "pub" clan. That doesn't mean we don't take the game seriously, we ABSOLUTELY take the game seriously. We just choose to do so in a fun, easy-going environment where people don't feel like they need to show off for everyone else. If you like the server, and you like our current members, click here to being your journey in IoW by applying to join. But we will never recruit a stranger! We are very proud of IoW and the IoW Code of Conduct. We are very selective of those who we allow to be in our clan. So if you're new to the game, and are looking for a good ET home, then play often on the server, don't be shy, introduce yourself on the forums and show some interest in being in the clan. Full version of the game and all patches. » What else are you playing? » Anyone who's played scribble with me knows this too well. » Happy New Year all!